The Atchison, Topeka, and Santa Fe Railroad ran special trains to encourage farmers along its routes. This is a two page newspaper that was distributed in Kansas in 1925. The content contains information about improving wheat farming, dealing with the Hessian Fly, etc. J. F. Jarrell, AT&SF promotions, gives the company's reasons for running the trains on page two. He wrote that the lectures and demonstrations that accompany the train provides the farmers with the latest information on how to improve their yields. Another article on page two is by J. C. Mohler, secretary of the Kansas Board of Agriculture. Mohler states that Kansas is top in wheat production but that farmers need to continue to update their practices to improve quality and quantity. 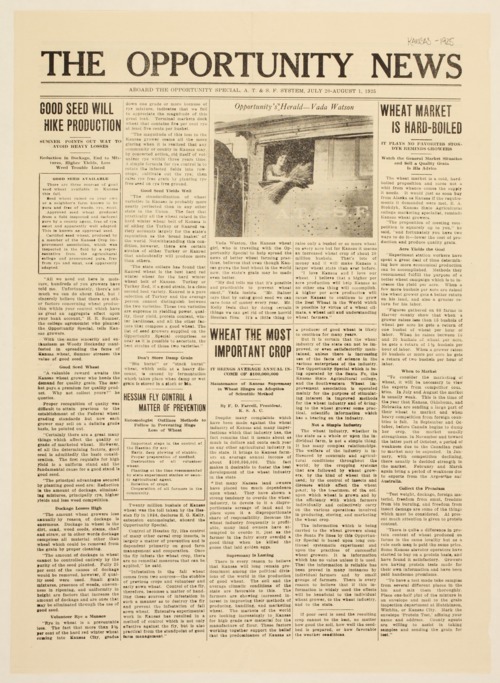 There is a picture of Vada Watson, the Kansas Wheat Girl, on page one.